Isaiah 2:7-8 (NKJV) Their land is also full of silver and gold, and there is no end to their treasures; their land is also full of horses, and there is no end to their chariots. 8 Their land is also full of idols; they worship the work of their own hands, that which their own fingers have made. The car industry is doing great, it’s marriages that I’m worried about. General Motors and Ford Motor Company alone brought in 302.3 billion dollars last year—that’s approximately one billion dollars per U.S.A. citizen spent on cars just for those two car makers. Americans love their cars. It’s obvious; they are financing them for longer and longer terms. Five to six years is the norm with the number of 7-10 year loans rapidly increasing. On the other hand, the average length of marriage in the United States is eight years. 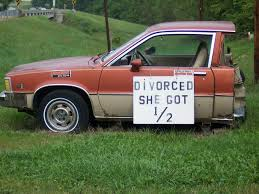 It seems that people are more committed to their cars than their marriage. I say divorce your car and start investing in your marriage. Don’t settle for a fine car and a “junker” marriage; get an old junker that can get you around town and insist on having a fine marriage. Tags: commitment, marriage. Bookmark the permalink.